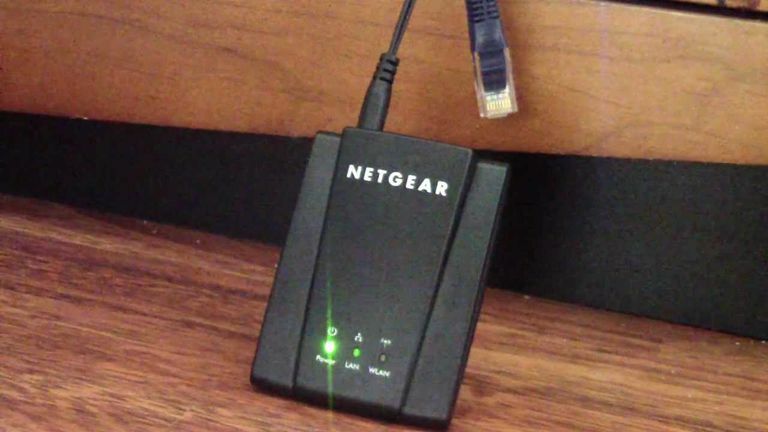 Netgear's WNCE2001 Universal Wifi Internet Adapter is possibly the best way to connect your network media player, networked TV, or networked home theater device or game console to your wireless home network. With this Wifi adapter, there is no need to configure your network media player or device. Wireless access is as easy as connecting an Ethernet cable and a USB cable. In real-use testing scenarios, the WNCE2001 is faster than most other wireless dongles and power-line adapters. Easy initial setup using push-button security or using a computer. A fast wireless connection is fast for better media streaming. USB connection powers device; there is no need to run power to an outlet. Can be moved from device to device without setup. Indicator lights confirm that the device is wirelessly connected to the home network and internet. According to the Netgear product support page, there have been firmware updates to fix problems; but we haven't found anything that we don't like about the WNCE2001. It is easier to get started with Netgear's Universal Wifi Internet Adapter than almost any other wireless dongle. A novice could have someone else set up the WNCE2001 and not have to think about it again. There is little or no configuration involved in the setup. Thereafter, there is no need to configure the network media player or network home theater device in order to access your home's wifi network. If you have a wireless router with push-to-connect security (WPS), your network media player or home theater device can connect to your home's wifi in about a minute. Connect Netgear's Universal Wifi Internet Adapter to your device using the Ethernet cable and connect to power the adapter, using the USB-to-power cable. Then, press the WPS button on the Adapter and on your router. Your network media player or device will immediately connect to your home network and the internet. If you connect to your wireless router by finding the wifi network name and entering a password, the WNCE2001 will be ready in fewer than 5 minutes. Following the WNCE2001's quick start guide, connect the device to your computer. The setup will automatically show up in your web browser, where you can choose your network and put in the password. As it states in the guide, be sure to turn off your computer's wireless connection before setting up. Not only can the WNCE2001 be used on devices, we have connected it to a desktop computer that does not have wireless capability and it worked perfectly. Plus, it can be moved from device to device, usually without any further setup. This is Netgear's Universal Wifi Internet Adapter. While wireless dongles connect via USB, the WNCE2001 connects to your device using an Ethernet cable. Most network media players and networked home theater devices require that you use a specific dongle made by the manufacturer to connect wirelessly. The Ethernet cable connection bypasses that requirement and can enable any device to connect to your wifi home network. When connecting a wireless dongle, you must go into the network media player's setup menu to choose the wifi network and enter the password. If the dongle becomes disconnected from the network, you will probably have to set it up again. Because the WNCE2001 is connected to the network media player or networked device using an Ethernet cable, the device thinks it is using a wired connection. There is no setup required on the device as a wired connection is usually the default setting. If the network media player or device you are connecting doesn't automatically connect, try going into the menus to tell the device to use a wired network connection. Go into the Network submenu — found under the setup or general" menu — and choose wired. Beyond its ease of use and portability, the WNCE2001 is an excellent performer. The WNCE2001 gave us the best performance in high definition and 3D high-definition video streaming. There were no interruptions, no buffering, and the picture quality was as flawless as the original that was being streamed. In our regular-use speed tests — connected to an Apple Airport wireless router with internet speeds coming in at 50 Mb/s or more — we were able to achieve speeds more than 22 Mb/s. Other wifi dongles were receiving 5 Mb/s and power-line adapters were receiving around 10 to 12 Mb/s. Because it is so easy to move the WNCE2001 between devices without further setup, you can regularly swap it between your network TV, Blu-ray player, and network media player. It can also be taken into another room for a device to access the network without worrying about connecting a powerline adapter or wireless bridge. The Netgear WNCE2001 Universal Wifi Internet Adapter will work with any network device as they all have an Ethernet port. If you have devices that you want to wirelessly connect to your home network, including your network-enabled home theater components, and the internet, this is the Wifi adapter to get.